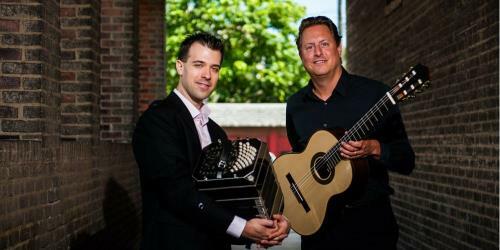 String Theory, in partnership with Lee University and the Hunter Museum of American Art, will continue its tenth season with a holiday concert featuring Grammy Award-winning guitarist Jason Vieux and accordionist Julien Labro. The concert will take place on Tuesday at 6:30 p.m. at the museum. The December concert, sponsored by Pinnacle Financial Partners, will feature works by Gnattali, Metheny, P­ärt, and Piazzola. Described by NPR as “perhaps the most precise and soulful classical guitarist of his generation,” Mr. Vieaux has earned a reputation for putting his expressiveness and virtuosity at the service of a remarkably wide range of music. His most recent solo album, “Play,” won the 2015 Grammy Award for Best Classical Instrumental Solo. Mr. Vieaux’s recent performances include Caramoor Festival as artist-in-residence, Chamber Music Society of Lincoln Center, Philadelphia Chamber Music Society, Buenos Aires’ Teatro Colon, Amsterdam’s Concertgebouw, and Ravinia Festival. In 2012, the Jason Vieaux School of Classical Guitar was launched, providing one-on-one online study with Mr. Vieaux for guitar students around the world. He also co-founded the guitar department at the Curtis Institute of Music in 2011 and heads the guitar department of the Cleveland Institute of Music. Mr. Vieaux is the recipient of a Naumburg Foundation top prize, a Cleveland Institute of Music Alumni Achievement Award, and a Salon di Virtuosi Career Grant. Heralded as “the next accordion star” by Howard Reich of the Chicago Tribune, Mr. Labro has established himself as one of the foremost accordion and bandoneón players in classical and jazz genres. Deemed to be “a triple threat: brilliant technician, poetic melodist and cunning arranger,” his artistry, virtuosity, and creativity as a musician, composer, and arranger have earned him international acclaim and continue to astonish audiences worldwide. Mr. Labro has collaborated with several artists, including A Far Cry, Ensemble Vivant of Toronto, and Tommy Emmanuel. He has performed across the United States and held masterclasses at renowned institutions such as the Oberlin Conservatory of Music, Princeton University, Hope College, and the Cleveland Institute of Music. For more information on String Theory at the Hunter Museum of American Art or to purchase tickets, call 414-2525 or visit www.stringtheorymusic.org.